P. and I both love snacks combining dark chocolate and nuts. They are a favorite during the days we are lucky to spend at home, when we are hiking and traveling — perfect for any on-the-go occasion, really. Being pregnant has not changed this habit in me whatsoever — quite on the contrary, I should admit. I remember that when I first moved to Boston, we used to buy a sweet treat called temptations bars. Whole Foods sold them. 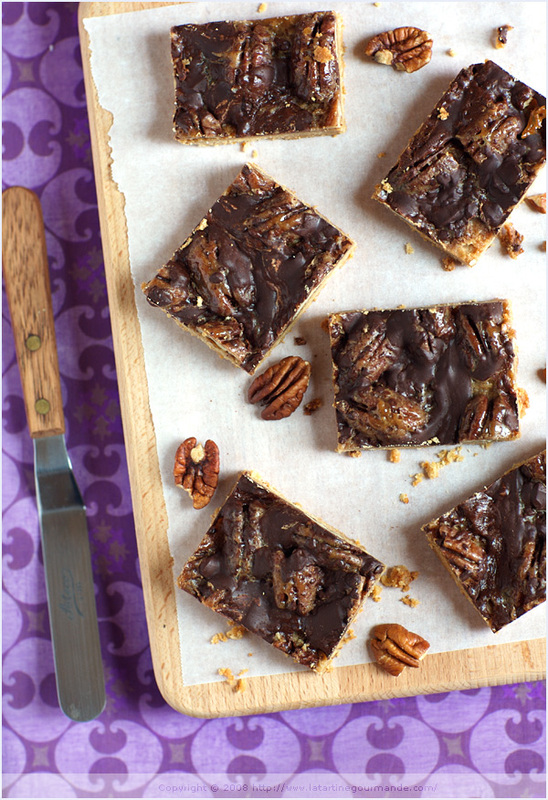 They were simple but deliciously good: a shortbread base, caramel, pecans and chocolate were combined to make an irresistible treat. They were the first thing that caught my attention in my friend baker and food blogger Anita Chu‘s new cookbook, Field Guide to Cookies, which she kindly asked me to review, along with eight other avid and talented food blogger/bakers (which list is easily found by following this link). Field Guide to Cookies, or How to Identify and Bake Virtually Every Cookie Imaginable, is a small compact cookbook designed to cover the basics of many popular cookies, some of which I am sure you know, and some which you will be delighted to discover. The book itself is divided in four clear sections covering 100 illustrated recipes: Drop Cookies, Bar Cookies, Molded Cookies and to finish, Rolled Cookies — enough to bring you in a comfortable sugar coma. Each recipe is introduced with a general description followed by a short history, which is a nice way to become better educated about cookies. And, since the book holds easily in one hand too, it can conveniently be packed for a trip, should you feel the need to bake while you are away. A nice gift to make to anyone with a sweet tooth, really. Who could not be tempted by a homemade cookie? I asked Anita a few questions about the making of the book, to hear more about her recent experience. Me: What is your expectation/goal in having written the book? Anita: In writing a Field Guide to Cookies, I was hoping to cover a range of cookies both familiar and unusual. I have a kind of scientific mind – I really enjoy categorizing desserts and trying to figure how they work and how different pastries are related to each other. So it was really fun to do a lot of research into cookies and find out about their history and how different cookies often evolved from the same base recipe. It was really fascinating. And, of course, since, it was a field guide, it was a challenge to figure out the “best”, or at least a pretty good version of each of these cookies!! In writing a book, it fulfilled one of my lifelong dreams, which was to be published! I have always loved reading and writing since I was young, and have kept various journals and done other creative writing as I was growing up. When I started my blog, it was as much to practice my baking as it was to practice writing; I felt the best way to improve my writing was to do a lot of it. I’m very gratified that it has improved to the point where someone thought I could be published. That is one of the biggest thrills for me! Me: Why did you chose this topic? Anita: The topic of cookies was decided by my publisher, Quirk Books. They were looking to expand their successful Field Guide line of books and came up with the idea of cookies. They approached me and asked it I would be interested. Since cookies are a big topic of interest for me, I said yes. I think they’re so great and fun to write about – everyone love cookies, they are simple to make, and in writing this book I discovered there are more varieties than I ever dreamed of! Me: What was the hardest/most challenging thing you encountered while writing the book? Anita: The biggest challenge was time, definitely. I am sure you understand about wanting to keep tinkering and experimenting with recipes, and I kept wishing I had more time to perfect those cookies! But I had to balance time between research and baking and writing and editing. It was a big lesson in time and resource management – and getting good at writing really fast! It helped to have a plan – I had schedules everywhere – and to be organized with my notes! Anita’s Turtle Bar recipe is straightforward. It requires basic ingredients easily available for any baker. I did not have any issue with the recipe beside finding out along the way that the measurements of the pan used to make the base of the cookie were inaccurate. Unsure at first, I asked Anita, of course. She agreed that the measurements of the pan were indeed wrong. Nothing serious, and I was glad to have had the intuition. 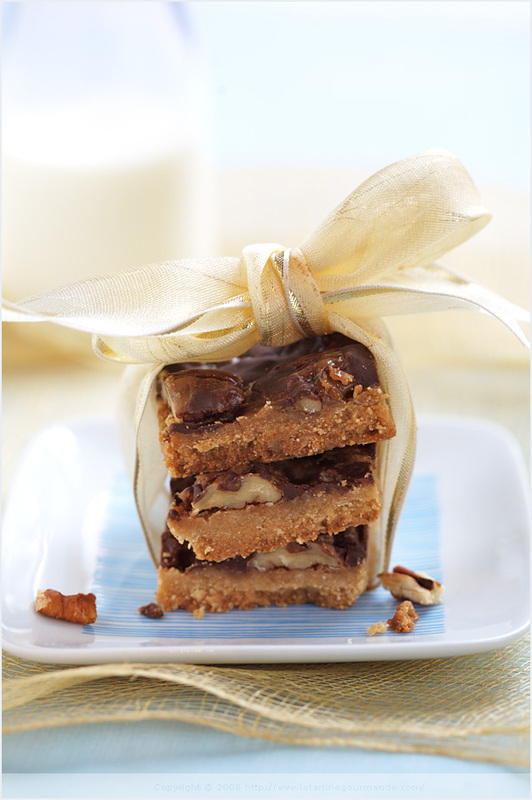 The cookie has three layers: a shortbread base on top of which pecans, caramel and dark chocolate are combined. I first made the recipe as it was, then decided to adapt it, preparing a variant using gluten free flours (quinoa, white rice flours, along with quinoa flakes) and less caramel. Both were a great treat. Lots of luck for the launch of Anita’s new cookbook, and a big thank for including me in the bunch of happy testers! Preheat the oven at 350 F. Line a 9 by 13 inch pan (I used a 8 x 8 inch pan) with aluminum foil, leaving enough to hang over the edge and act as handles to remove bars after baking. Grease foil with cooking spray. Combine flour, sugar, and salt in a food processor and blend briefly to combine. Cut butter in small pieces and sprinkle over flour mixture. Process until the mixture resembles coarse crumbs. Press the mixture into the bottom of the pan. Bake for 18 to 20 minutes, until the crust is golden and firm and dry. Leave the oven on at the same temperature. Combine the cream, butter, salt, and brown sugar in a saucepan and bring to a boil for about 1 minute. Spread the pecans over the top of the crust. Pour the hot caramel filling evenly over the pecans. Bake for 15 to 20 minutes, until the caramel topping darkens. Remove from the oven and sprinkle the chocolate chips over the hot topping. Let sit for a few moments and then use a knife or offset spatula to spread the melted chocolate evenly over the top. Chill the bars in the refrigerator for about 30 minutes or until the bars have fully set before slicing them. Using foil as handles, pull bars from pan and place on cutting board. Cut long side into 9 strips, then cut 4 strips across the short side, creating 36 bars. Wipe the knife clean between cuts. Miam! This looks wonderful. I have to try this (and feed them to somebody else otherwise I shall not fit in my clothes anymore). Thanks. Exactement le genre de gourmandises qu’il ne faut pas me mettre sou le nez. Sinon…on ne peut plus m’arrêter! I work at a bookstore, I’ll look to see if we have a copy on the shelves. Maybe I’ll add it to my Christmas list! Thanks for the idea. The book you did the photography work for, is it out yet? I’m really looking forward to seeing it. speechless!!! The pictures speak for themselves! Wow this looks so yumm. Here at home hubby, daughter and I love the nut and chocolarte combination . They look drop-dead gorgeous! I love those kinds of rich and scrumptious bars! Wonderful! What a lovely post as we all get ready to start our Christmas baking projects. The cold weather is making me rather more snackish than usual and these look cold-weather approved, if you know what I mean! Lovely post, great interview, thank you, Bea. As always. La première photo est inhumaine ! c’est sublime !! Thank you so much for a beautiful spin on my turtle bars! I’m so pleased that you were able to participate in this blog tour – I appreciate your support and friendship as always! thank you for mentioning the gluten-free idea too. Wonderfull, as usual, It’s difficult for me to find pecans, can I use italian nuts? now i’m going to have to make these. they look so good bea! Ces petites bouchées ont l’air divine….j’en veux !!!!!!!!!!!!! So glad you posted these as we loved eating them, ehehe!! They are dangerous to have around the house! I bet baby was a happy after a couple of these! The cookbook sounds really good, and the bars look delicious! I’m with you on the dark chocolate-nut combination. Beautiful pictures! Those look soooo good I am DYING! Ooooohhhh j’en veux aussi! Would you be so kind as to give the ratio of flours for the gluten free version? I am having a friend who can’t eat gluten over for dinner and these sound like just the ticket for desert. Je sens que je vais bien me régaler…. Beautiful! I love turtle bars, but I love them even more after seeing how yours came out. Simply gorgeous. Found your Blog while looking for Gluten Free Blogs. Thank you everyone. Merci beaucoup à tout le monde. Anita will be thrilled, I am sure. As to the gluten free version, believe it or not, but I did not make notes, so I would guess now that I did about 1/3 of each flour, between the rice, quinoa and quinoa flakes. If only all turtles looked so good! AMAZING! These are on my list of things to make in the next month. I just had to link to you on my blog. This recipe looks amazing and I would LOVE to make it for my father, unfortunatley he has type 2 diabetes and I’m pretty sure this would just about kill him. Any ideas on how to make it a bit more diabetic friendly? Ca a tout l’air tres delicieux! i love the pictures, really nice! Bravo! part candy. What could be better. These turtle bars would make a lovely gift for guests at an event. Especially with the gold ribbon. I look forward to trying the recipe. Made this yesterday for a dinner party. Came out pretty good, but much too rich. I would cut the butter in half. These are my children’s favorite Christmas cookie. I lure them home for holidays with these bars. Thank you for sharing the recipe. I’m trying to make these vegan..would it be possible to replace the heavy whipping cream with coconut milk or would the consistency not turn out right? Please let me know! Also, to make these gluten free would an all-purpose gluten free flour blend work just as well as the flour combination you listed? I made these recently and they tasted wonderful. It might have been because of conversion problems, but the bars were quite high on fat. To cut the fat I swapped caramel for Dulce de leche and reduced the baking time after adding the Dulce to 10 minutes. I’ve made them several times now and they are very moreish.